Plaintiff, E.C., a 79 year old house-keeper from Honduras, was walking on a public sidewalk in the area of SW 1st Avenue and SW 9th Street, in Miami, Florida. She was injured, when she tripped and fell over a portion of the sidewalk that was uneven, and raised above the rest of the sidewalk. Apparently, roots from a large tree, owned and maintained by the City of Miami, had grown under sidewalk and lifted up the concrete slab. As a result, E.C. tripped and fell, fracturing her right wrist, trying to break her fall. E.C. 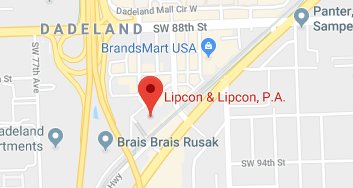 hired the law firm of Lipcon & Lipcon, P.A., Personal Injury Lawyers in Miami. She stated that she had interviewed many law firms but was satisfied with Lipcon & Lipcon’s reputation of success in claims against the city, county and State for other negligence claims. David Lipcon was able to secure a settlement for E.C. for the full amount of money available pursuant to the Florida Waiver of Sovereign Immunity Act. He explained that the government entities have a cap on amounts they have to pay for injured claimants. The state rarely pays its policy limits prior to litigation.